Fire officials announce No July 4 Fire Restriction. Caution is still urged. After many years of fire restrictions during the Independence Day holiday, fire officials are pleased to announce moisture levels are higher this year providing less wildland fire danger. 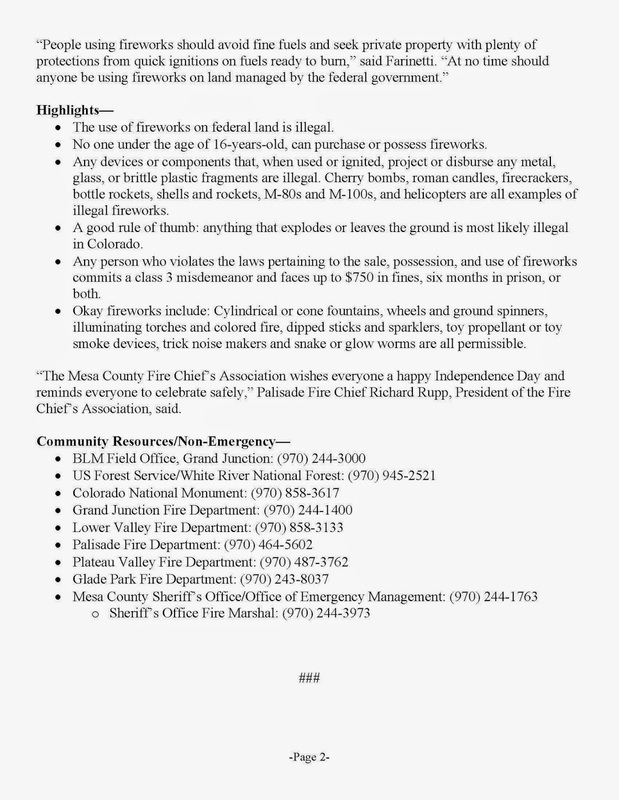 Mesa County urges residents to use caution when celebrating with fireworks. • Okay fireworks include: Cylindrical or cone fountains, wheels and ground spinners, illuminating torches and colored fire, dipped sticks and sparklers, toy propellant or toy smoke devices, trick noise makers and snake or glow worms are all permissible. • The use of fireworks on federal land is illegal. • No one under the age of 16-years-old, can purchase or possess fireworks. • Any devices or components that, when used or ignited, project or disburse any metal, glass, or brittle plastic fragments are illegal. Cherry bombs, roman candles, firecrackers, bottle rockets, shells and rockets, M-80s and M-100s, and helicopters are all examples of illegal fireworks. • Any person who violates the laws pertaining to the sale, possession, and use of fireworks commits a class 3 misdemeanor and faces up to $750 in fines, six months in prison, or both. 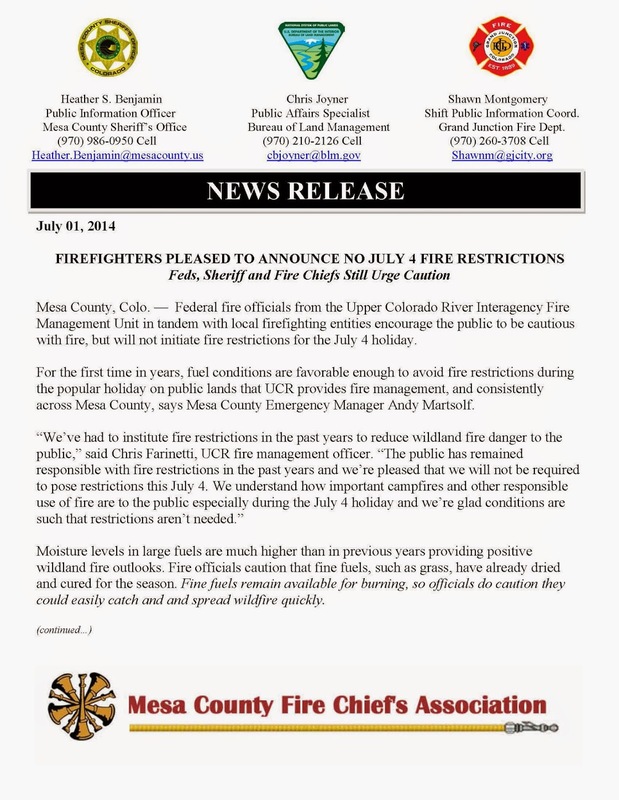 See July 1, 2014 Mesa County Fire Chiefs Association news release. Many Mesa County Offices will be closed on Friday, July 4, 2014 in honor of Independence Day. Please visit us again when these offices re-open to the public on Monday, July 7, 2014. **Please note: Mesa County Landfill, Hazardous Waste Collection Facility, Organic Material Composting Facility, and waste transfer stations will reopen on Saturday, July 5th during normal operating hours. Today, Commissioner Justman meets with Governor Hickenlooper, as part of a meeting hosted by Club 20 being held in Glenwood Springs, Colorado. "We respectfully request that you bring this significant matter to the attention of, and encourage discussion between, the Washington, D.C. offices of the Department of the Interior, other federal agencies, the State of Colorado and the local governments affected by stormwater runoff from Federal Lands. Mesa County proposes hosting a dialogue with federal lands agencies, including, but not limited to, the Bureau of Land Management and the National Park Service, as well as various local governments, in an attempt to receive active (monetary or project) contribution for maintenance and improvement of these drainage ways. We also request that a continuing dialogue occur between the Colorado Department of Health and the Environment and local governments during the rule-making process on water quality regulations."